Name of a treatise in the Mishnah, Tosefta, and Yerushalmi, devoted to a consideration of the law, found in Lev. xix. 23-25, which ordains that the fruit of a newly planted tree shall be regarded as "'orlah" (A. V. "uncircumcised") for the first three years, and that therefore it may not be eaten. This treatise is the tenth in the mishnaic order Zera'im, and is divided into three chapters, containing thirty-five paragraphs in all. Ch. i.: The conditions which exempt trees from or subject them to the law of 'orlah (§§ 1-5); mixing of young shoots of 'orlah or "kil'ayim" with other young shoots (§ 6); parts of the tree which are not considered fruit, such as leaves, blossoms, and sap, and which are therefore not forbidden, either as 'orlah in the case of a young tree, or to the Nazarite in the case of the vine; it is noted in passing, however, that in the case of a tree dedicated to idolatry (the Asherah) the use of these parts in any way is likewise forbidden (§ 7); the parts which are considered fruit in reference to 'orlah, but not in reference to "reba'i" (the fourth year); so that, although these parts may not be eaten during the first three years, it is not obligatory to take them to Jerusalem in the fourth year (§ 8; comp. Lev. xix. 24); concerning the planting of 'orlah shoots (§ 9). Ch. ii. 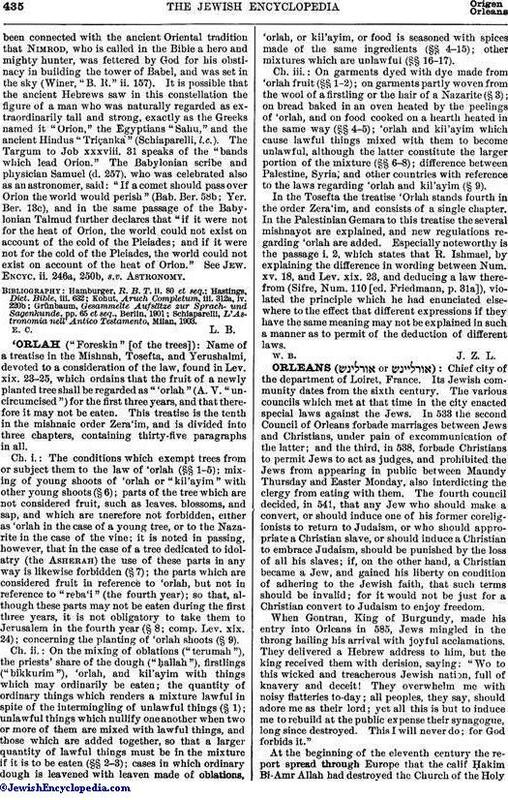 : On the mixing of oblations ("terumah"), the priests' share of the dough ("ḥallah"), firstlings ("bikkurm"), 'orlah, and kil'ayim with things which may ordinarily be eaten; the quantity of ordinary things which renders a mixture lawful in spite of the intermingling of unlawful things (§ 1); unlawful things which nullify one another when two or more of them are mixed with lawful things, and those which are added together, so that a larger quantity of lawful things must be in the mixture if it is to be eaten (§§ 2-3); cases in which ordinary dough is leavened with leaven made of oblations, 'orlah, or kil'ayim, or food is seasoned with spices made of the same ingredients (§§ 4-15); other mixtures which are unlawful (§§ 16-17). Ch. iii. : On garments dyed with dye made from 'orlah fruit (§§ 1-2); on garments partly woven from the wool of a firstling or the hair of a Nazarite (§ 3); on bread baked in an oven heated by the peelings of 'orlah, and on food cooked on a hearth heated in the same way (§§ 4-5); 'orlah and kil'ayim which cause lawful things mixed with them to become unlawful, although the latter constitute the larger portion of the mixture (§§ 6-8); difference between Palestine, Syria; and other countries with reference to the laws regarding 'orlah and kil'ayim (§ 9). In the Tosefta the treatise 'Orlah stands fourth in the order Zera'im, and consists of a single chapter. In the Palestinian Gemara to this treatise the several mishnayot are explained, and new regulations regarding 'orlah are added. Especially noteworthy is the passage i. 2, which states that R. Ishmael, by explaining the difference in wording between Num. xv. 18, and Lev. xix. 23, and deducing a law therefrom (Sifre, Num. 110 [ed. Friedmann, p. 31a]), violated the principle which he had enunciated elsewhere to the effect that different expressions if they have the same meaning may not be explained in such a manner as to permit of the deduction of different laws.